Excellent for the price. They are very comfortable and surprisingly good quality. The fit was good size 39. Im very happy with this purchase. Excellent for the price. They are very comfortable and surprisingly good quality. The fit was good size 39. Im very happy with this purchase. I m very satisfied with my order although at first I was afraid to buy shoes from the web! This was the best buy I have done for a long time. The only disadvantage was that I had to wait more than a month to get them..
p.s. Post office made me pay for custom fees but lightinthebox gave me a full refund! So I would advice taking the custom insurance when ordering.. I m very satisfied with my order although at first I was afraid to buy shoes from the web! This was the best buy I have done for a long time. The only disadvantage was that I had to wait more than a month to get them..
p.s. Post office made me pay for custom fees but lightinthebox gave me a full refund! So I would advice taking the custom insurance when ordering..
Dear Martina, Sure, as long as Customers paid for the tax insurance, well fully refund the tax fee to them. If you’ve paid for the tax insurance, you may submit a ticket. This is the link for contacting customer service: http://www.lightinthebox.com/knowledge-base/c1192/a2974.html. They will be glad to provide professional help within 24 hours. Dear Martina, Sure, as long as Customers paid for the tax insurance, well fully refund the tax fee to them. If you’ve paid for the tax insurance, you may submit a ticket. This is the link for contacting customer service: http://www.lightinthebox.com/knowledge-base/c1192/a2974.html. They will be glad to provide professional help within 24 hours. Αγαπητέ πελάτη, σας ευχαριστούμε για τις αγορές μαζί μας. Λυπούμαστε πραγματικά γι αυτό. Εάν χρειάζεστε βοήθεια από την υπηρεσία μετά την πώληση, μπορείτε να υποβάλετε ένα εισιτήριο. Αυτός είναι ο σύνδεσμος για την επικοινωνία με την υπηρεσία του πελάτη: http://www.lightinthebox.com/knowledge-base/c1192/a2974.html. Θα χαρούν να παρέχουν επαγγελματική βοήθεια εντός 24 ωρών. Αγαπητέ πελάτη, σας ευχαριστούμε για τις αγορές μαζί μας. Λυπούμαστε πραγματικά γι αυτό. Εάν χρειάζεστε βοήθεια από την υπηρεσία μετά την πώληση, μπορείτε να υποβάλετε ένα εισιτήριο. Αυτός είναι ο σύνδεσμος για την επικοινωνία με την υπηρεσία του πελάτη: http://www.lightinthebox.com/knowledge-base/c1192/a2974.html. Θα χαρούν να παρέχουν επαγγελματική βοήθεια εντός 24 ωρών. Die Schuhe passen hervorragend. Aussehen tun sie traumhaft. Meine Tochter meinte, dass wären Disney Princess Schuhe. Ich bin wirklich begeistert. Meine Hochzeit kann kommen. Die Schuhe passen hervorragend. Aussehen tun sie traumhaft. Meine Tochter meinte, dass wären Disney Princess Schuhe. Ich bin wirklich begeistert. Meine Hochzeit kann kommen. vielen Dank für den Einkauf bei uns. Es ist schön dass Ihre Tochter und Sie unsere Schuhe mögen. Alles Gute zu Ihrer Hochzeit! 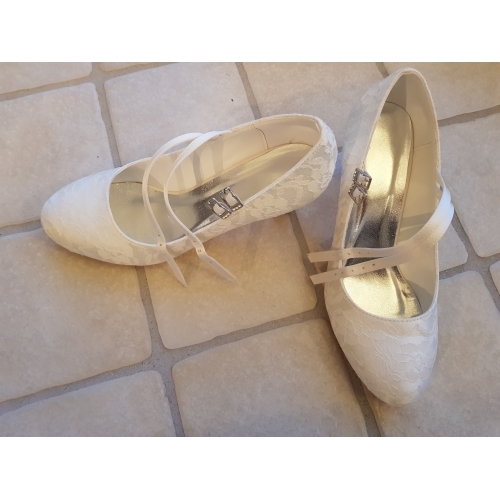 Lovely, elegant wedding shoes. I love the colour and pattern. 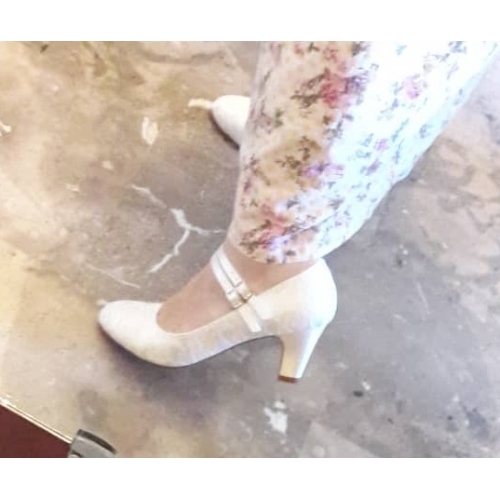 Lovely, elegant wedding shoes. I love the colour and pattern. Boty jsou krasne a v poradku,nicmene byla sem prekvapena,kdyz mi je zabavili na celnici a musela sem pak pri prevzeti platit jeste 910 korun za procleni a DPH....Takze za me z tohoto portalu jiz objednavat nebudu. Boty jsou krasne a v poradku,nicmene byla sem prekvapena,kdyz mi je zabavili na celnici a musela sem pak pri prevzeti platit jeste 910 korun za procleni a DPH....Takze za me z tohoto portalu jiz objednavat nebudu. The shoes arrived in good time. I ordered the bigger size as i was worried about the half size difference in sizes 7.5-8. The shoes are a little big but the straps and an insole will solve this problem. Great ivory colour- closer to white which matches my dress well. The lace pattern is really pretty as well. Heel height is perfect. Only concern is the fastenings feel very delicate which worries me. I hope they dont break. Overall a good purchase and I am happy with my choice. The shoes arrived in good time. Overall a good purchase and I am happy with my choice.